President Obama denied the claim according to a US spokesperson. PRESIDENT BARACK OBAMA has told German Chancellor Angela Merkel that the US is not monitoring her communications. The German government had received information that US intelligence is spying on the mobile phone communications of Chancellor Angela Merkel, leading to Merkel contacting Obama directly. “The chancellor today telephoned President (Barack) Obama” and “made clear that she unequivocally disapproves of such practices, should they be confirmed, and regards them as completely unacceptable,” Merkel’s spokesman Steffen Seibert said in a statement. Berlin had demanded “an immediate and comprehensive explanation” from Washington. “Among close friends and partners, as the Federal Republic of Germany and the US have been for decades, there should be no such monitoring of the communications of a head of government,” the statement added, indirectly citing Merkel’s comments to Obama. “This would be a serious breach of trust. Such practices must be prevented immediately,” the German chancellor told Obama, the statement said. 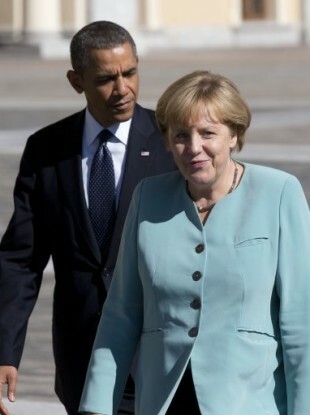 Email “Merkel calls Obama over claims the US is spying on her mobile phone”. Feedback on “Merkel calls Obama over claims the US is spying on her mobile phone”.